A passed-out guy with slicked back hair slumps over on a disheveled bed. He might be dead for all we know—his skin looks pale and blue from the glow of his laptop screen. He wears a t-shirt with no pants. Propping this sad sack up is a grey-skinned redhead in her underwear, balancing a cigarette in her grimacing lips as she reaches under his arms and types on the keyboard. This is the scene in “Ghost Writer,” a painting by Justin John Greene, and it’s a knockout. It’s one of eight paintings in his current show at Andrew Rafacz Gallery, “Secret Slob.” The title comes from “The Catcher in the Rye”; a “secret slob” is someone who behaves as outwardly virtuous while hiding their sordid habits. Greene spent a few years in Chicago studying painting at the School of the Art Institute of Chicago, and has since returned to his hometown and his muse, Los Angeles. We can almost hear the neon lights buzzing in his paintings. 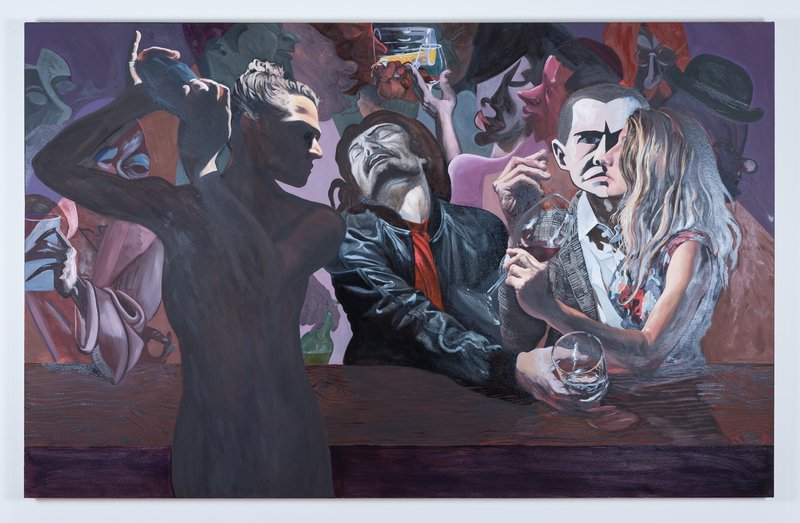 Their unnatural blue, pink and green hues illuminate the twisted faces and hands of his chiaroscuro characters. His work weaves aloof but saucy narratives, incorporating Hollywood drama into surreal mash-ups. By mixing film, literary and art-historical references like Baroque tavern paintings, Harlem Renaissance paintings, Cubism and early Warner Brothers cartoons, Greene is able to showcase his dexterity as a painter and his cultural literacy while offering a point of interest for almost any viewer. “I’m interested in ideas that are uncannily familiar; concepts of American heritage, embedded in our collective memory. I like to play with that moment of recognition because I think it puts people at ease and encourages one to spend more time looking,” he remarked in a 2013 interview.